Timing is everything. A year after Raiders Of The Lost Ark created a vogue for self-reflexive throwbacks to 1940s adventure serials, writer-illustrator Dave Stevens unveiled a hero called the Rocketeer—a jet-propelled, World War II-era good guy in the Indiana Jones/Doc Savage mold, with a leggy girlfriend based on Bettie Page. It took a decade for the comic book to be successfully developed for the big screen, where it landed in the capable hands of Joe Johnston, a special effects whiz who’d not coincidentally won an Oscar for his work on Raiders. The idea of gifting such an obviously Spielbergian property to a young filmmaker who’d worked so closely with the master himself was self-evidently a good one. 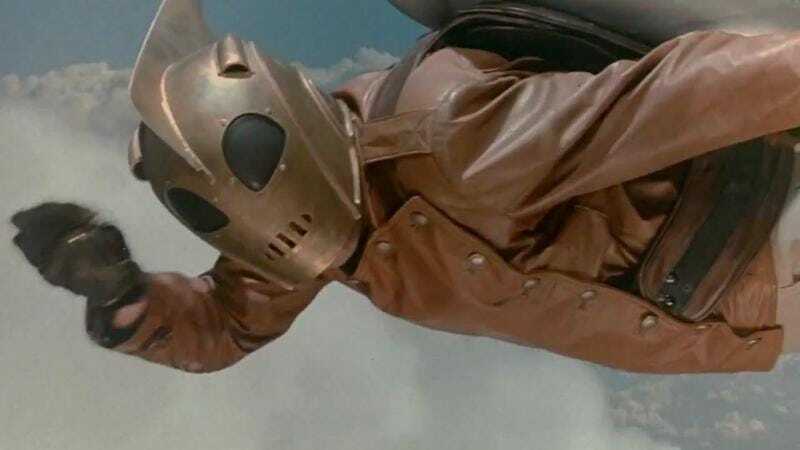 Yet The Rocketeer wasn’t anything close to a blockbuster—perhaps because critics felt compelled to compare it unfavorably to the Indiana Jones trilogy. In truth, the film feels just as close to Richard Donner’s original Superman and Back To The Future as Raiders. In the title role, Billy Campbell appears to be channeling Christopher Reeve’s square-jawed virtuousness (he grins like a kid on Christmas morning every time he takes flight with his stolen jetpack), while Alan Arkin’s wacky, tech-tinkering mechanic is comic relief à la Christopher Lloyd’s Doc Brown. The most entertaining performance, however, is given by Timothy Dalton, playing a villainous movie actor modeled on Errol Flynn, smartly riffing on his rakish image as James Bond in the process. His Neville Sinclair is a grade-A rotter right down to his Nazi sympathies. Johnston’s former workmates at Industrial Light & Magic did the special effects, which have a nicely stylized analog quality. While there’s nothing in the film quite as shocking or rousing as the sight of SS bullies having their heads melted by the wrath of God, a gag that finds American cops and robbers briefly joining forces to fend off German bad guys has an endearingly aw-shucks, crowd-pleasing tone. (It’s the sort of moment that Spielberg has practically patented). Viewed 25 years later, The Rocketeer isn’t quite the old-fashioned classic that its lush period décor and vertiginously swirling James Horner score would have you believe. But it’s a likable knock-off, as well as a clear test run for Johnston’s later Captain America: The First Avenger, which was similarly steeped in Greatest Generation nostalgia. Availability: The Rocketeer is available on Blu-ray and DVD from Netflix or possibly your local video store/library. The film can also be rented or purchased through the major digital services, and is currently streaming on Netflix.